Summary: A cat and dog sit shivering outside a store with a sign reading “Pillows on Sale Today!!!”. 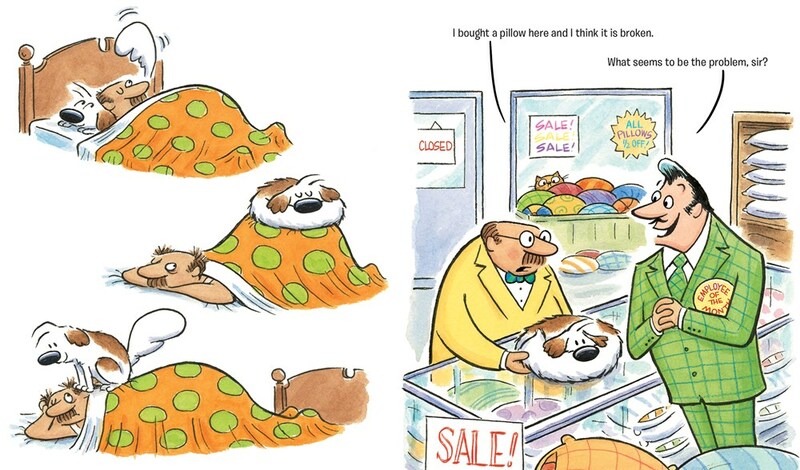 The dog scoots in just ahead of a customer and curls himself into a pillow shape. 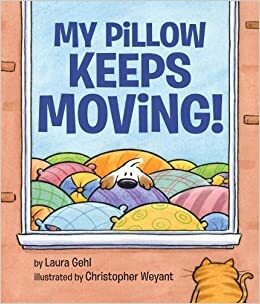 When the man gets home with his new “pillow”, he finds that it keeps moving while he sleeps. He tries to return it, but the clerk asks, “Is your pillow soft? Is it fluffy?” to which the man can only reply, “Yes”. Next, he goes shopping for a footstool, and the routine is repeated. (“My footstool is noisy!”) It happens again when he tries to buy a jacket. Finally, he tells the dog, “As a jacket, you stink, but maybe you’re more of a Jackie than a jacket,” and the dog has a new home. As the two head out to shop for a new hat, Jackie winks at the cat, and the next to last page shows Jackie and the man walking home with the cat perched on his head. On the final page, the three are sitting happily by the fire. 40 pages; ages 4-8. Pros: Told entirely with cartoon dialog, kids will find the visual humor hilarious. Cons: That cat looks like a heavy hat.